Today we are visiting Tripura, the last of North-eastern states in our Indian Food Odyssey. The name Tripura is Sanskrit, meaning "three cities" (corresponding exactly to the Greek Tripolis). The Sanskrit name is linked to Tripura Sundari, the presiding deity of the Tripura Sundari Temple at Udaipur, one of the 51 Shakti Peethas (pilgrimage centres of Shaktism),However, there have been suggestions to the effect that "the origin of the name Tripura is doubtful", raising the possibility that the Sanskritic form is just due to a folk etymology of a Tibeto-Burman (Kokborok) name. Variants of the name include Twipra, Tuipura and Tippera. The Kokborok-speaking Tripuri people are the major group among 19 tribes and many subtribes; Bengali people form the ethno-linguistic majority in Tripura. So, the cuisine of Tripura also has larger impact of Bengali cuisine. 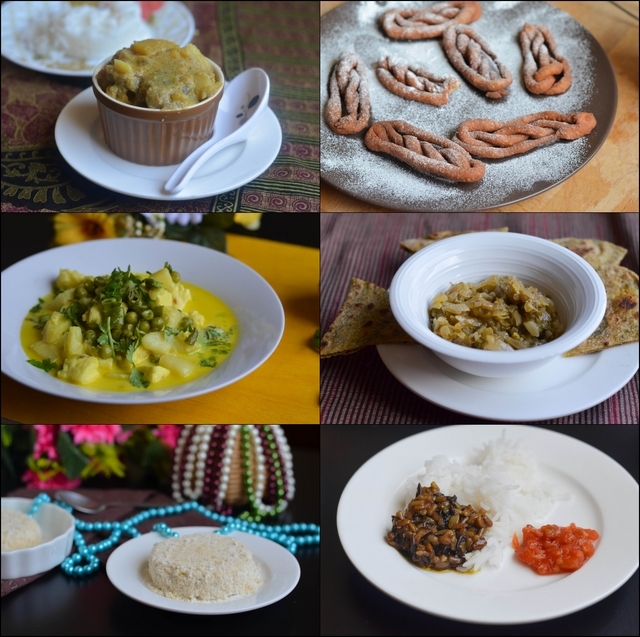 While looking for recipes in Tripuri cuisine, i was fortunate to stumple upon this facebook page Beautiful Tripura, which had an album called Food of tripura. While going through that album,i came across these recipes and tried them. 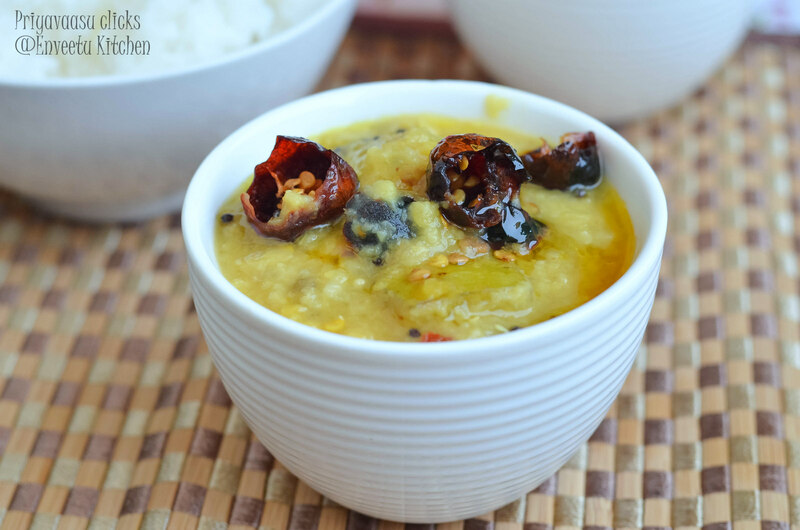 This Aam Dal is made on Chaitra Sankranti(New year's day), like south-Indian tradition to include 5 tastes in our palate, they too have dishes representing these 5 tastes on that day. The next dish is Chakoi, a simple curry made of lentils and any other veggies. 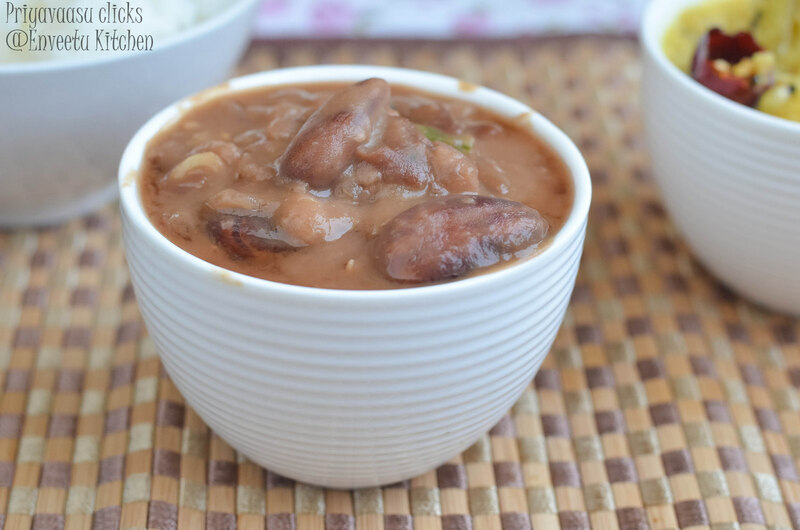 This dish is called khar in assamese and Ooti in Manipur. Amitar(Papaya) Chakoi, Spinach Chakoi, Kol Posalo Chakoi are other famous Chakoi recipes. Peel the white skin of jackfruit seeds. Pressure cook yellow peas and jackfruit seeds along with baking soda and salt with enough water for 3 whistles or until soft. Heat oil in kadai, splutter mustard seeds, add slited green chilies, chopped garlic, ginger and saute for a 2-3 minutes, next add the pressure cooked jackfruit seeds and yellow peas, mix together, add 1/2 cup of water. Let this simmer on the stove for 10 minutes. Take off the heat and serve along with Rice. Chop the mango into chunks, discard the seed. Take a Kadai, add the chopped mango and 1/2 Cup - 3/4 Cup water, turmeric and salt. Let the mangoes cook in a medium flame. Once the mangoes are cooked, add the cooked dal to this and another 1/2 Cup water and Sugar. Mix well. Let this simmer for another 10 minutes for the flavors to mingle. Take it off the heat. Heat a tadka pan, add mustard oil, add panch phoran and let the seeds crackle. Next add red chilies and turmeric. 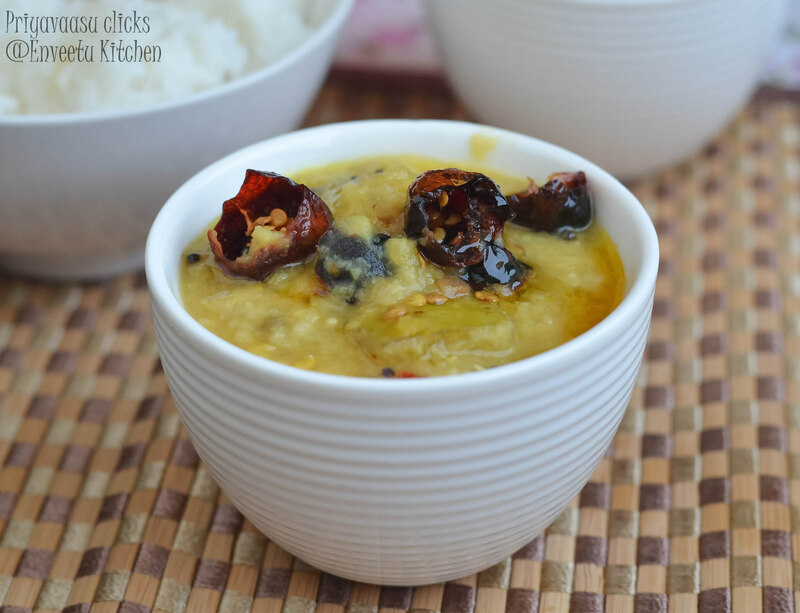 Pour this sizzling tempering over the dal. Serve Hot with Rice. The Seven Sister States also called "Paradise Unexplored," is a name given to the contiguous states of Arunachal Pradesh, Assam, Meghalaya, Manipur, Mizoram, Nagaland and Tripura in northeastern India. We bloggers doing this Mega Marathon, Indian food Odyssey have explored this treasure to our best to bring out the culinary treasures, a bit adapted to our taste. Though the sisters, gave us gitters when we started, but all is well that ends well!!! It was a great experience reading and cooking from this region of my Bharat Mahan! Here is a condensation of what i explored from this paradise unexplored!!! I appreciate your research a lot!!! I had a hard time to find recipes for such a long time for Tripura... 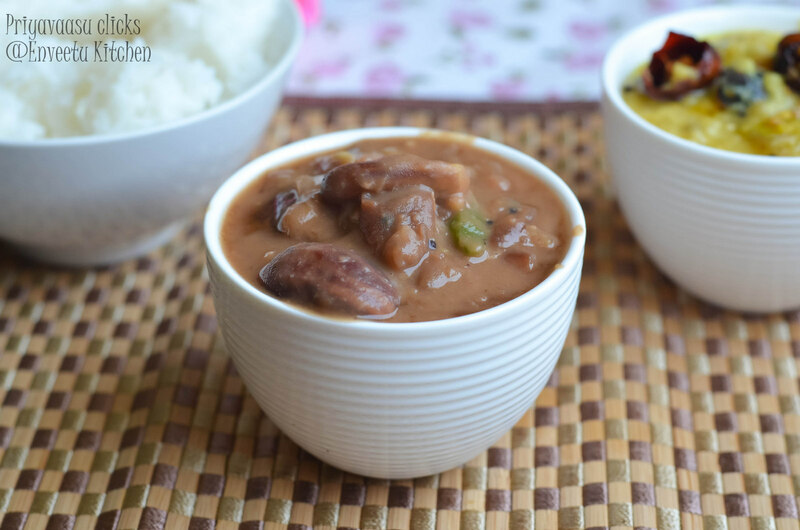 Both the gravy and the dal are very comforting!! Omg, i was searching for a dal for Tripura and ended myself to kosoi bwtwi, but u done a wonderful job, lovely dishes and beautiful choices again. That was a nice reference you found. Never had jackfruit seeds in a curry. The dishes look good together. Wow you have a nice collage done there Priya..coming to the jackfruit curry, wonder why I couldn't find it..:)..you surely deserve an award of ph.d for this..:)..trust me I had also gone thr the pages you sent, much earlier..but couldn't understand or maybe I was not interested..wish I had asked you to check those in the beginning..heheh..
You sure did your research Priya! Great find though! Very interesting and delicious dishes from Tripura. You made two dishes for the state? You indeed quite research on NE states and you do deserve a Ph.d. Good job on this. Delicious dishes for the state. 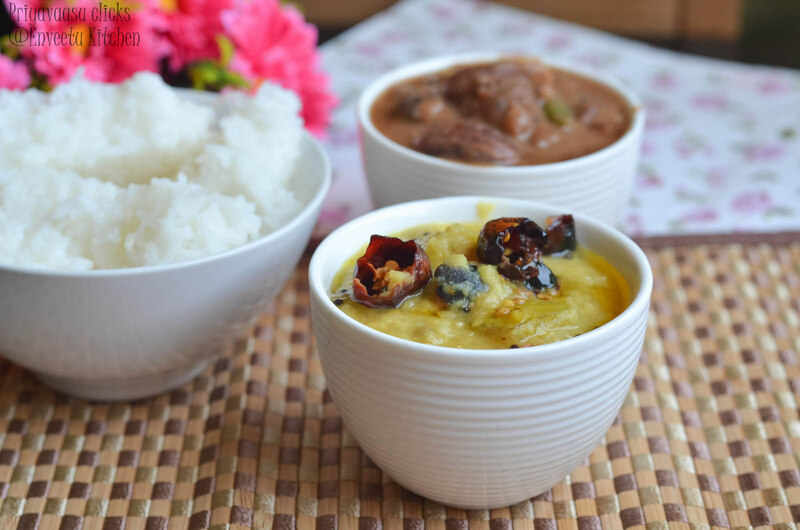 Both the dishes look so delicious and comfort dhal...nice clicks. 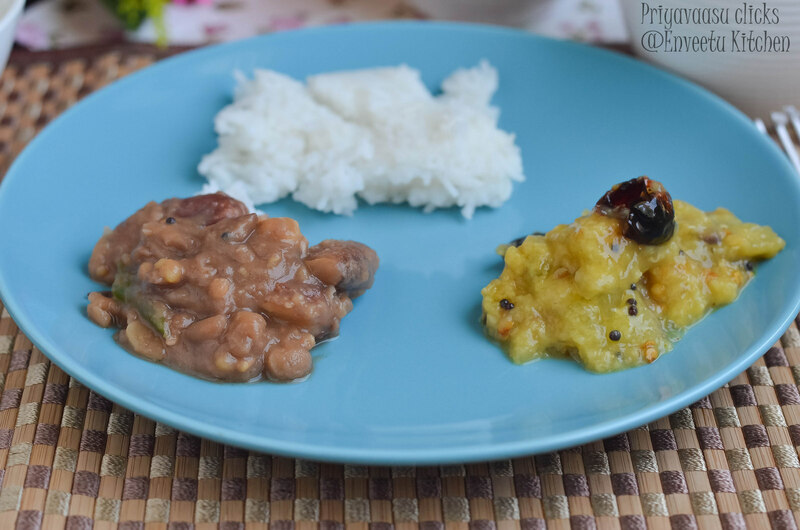 the jackfruit seed curry looks yummy.. what we wouldn't have done to catch hold of such a dish for Tripura.. you really are a googling master Priya..
both of these look great. Wish I had found that facebook group !! Dr. Priya this is awesome. You deserve the a big round of applause for the delicious dishes of NE States that you have come across and sharing it. Your research has lead you to amazing dishes..kudos dear.